This is the story of the first humans created by God, this story is found in Judaism and Christianity, in these it is mentioned that God, after having created the earth, light, seas, animals, and mountains, creates on the sixth day the man and the woman, who would be in charge of populating the world with their offspring. This narrative appears in Genesis, the first book of the Christian Bible and the Tanach, the story has many versions, since these sacred books have been modified and reinterpreted over time. The story of these appears in Genesis 1, 2 and 3, where it is commented how God made man from dust, created him in his likeness and called him Adam, when he falls asleep, I take one of his gossips and based on this I believe the woman, whom I call Eve, after creating Eve, Adam did not feel alone, but now, by creating them. 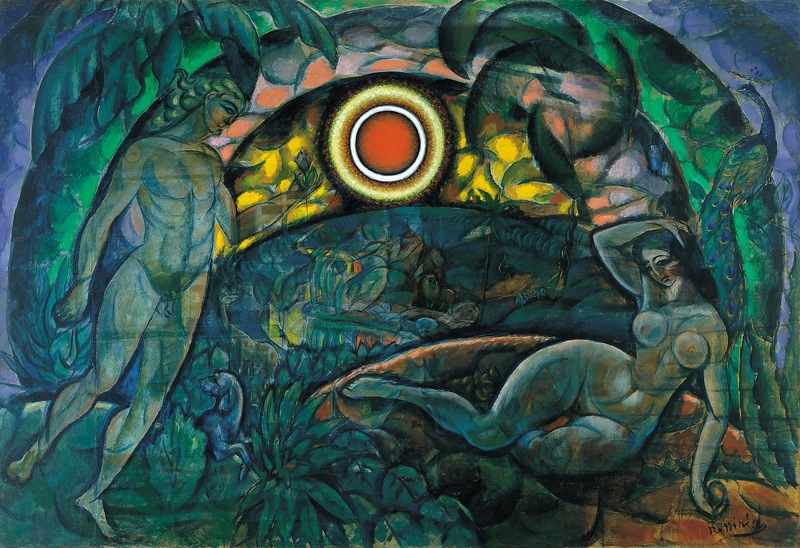 God ordered them to eat the fruit of the tree of good and evil, which was in the middle of the Garden of Eden, however, Eve is tempted by the serpent and eats the fruit, also shares it with Adam, to eat it they open their eyes and are aware of their nakedness, soon after God finds out the disobedience of these and punishes them. Adam takes away his immortality, the serpent is cursed and forced to crawl on the floor all his existence and Eve is punished to give birth in pain and live under the mandate of man. In addition to the previous version there is another, which is extracted from the Tanach, in which it is understood the existence of a woman prior to Eve, which they call "Lilith", this woman rebels against Adam by imposing herself as an equal. Later leaving Eden, which is why God created a second woman from Adam's side, so that would be different from Lilith, made her Adam's partner, so that Adam would not feel alone and be happy, then Eve is tempted and they are expelled of Eden. This version has been considerably criticized because although Lilith is mentioned in the Christian Bible, it is seen as a demon that attacks pregnant women and their children. The myth of Lilith, associated with the perspective of Canaanite women on sexuality and their position in front of the male figure, refusing to be treated as inferior, on this version it is mentioned that Lilith, resisted being below Adam, saying "Why should I lie under you? he lived and had children, this does not please God, which is why he was punished, his children being killed by the angels. Lilith took revenge for what they did, attacking pregnant women and their children. Since then Lilith has been described as a demon, succubus and has some allusions to vampirism. To conclude, according to scholars of the Bible and the symbology in it, it is believed that Genesis was written in the second half of the first millennium after Christ, and is inspired by the Assyrian culture and its gardens; these scholars, when interpreting the book, suggest that the forbidden fruit, of which no mention is made of. It has been taken as reference to the apple, which has been inspired by the Greek culture in which the term apple translates as "breast", for the Greeks these were the representation of desire and eroticism, the reason why it has been assumed that the fruit ingested by Adam and Eve. The representation of their sexuality, which is later taken as the "original without"; the interpretation is given to the serpent is associated with the demon "Satan", however, in the book the demon is not mentioned, later the idea that it was not real was extended, but it was a representation of the desires and sensitive pleasures of Eva, since it is she who listens to her. This perspective has been reaffirmed over time giving rise to a culture of violence against women.